We were walking along the trail and came to a downed tree. It was very large so we had to go off trail to get around it. Craig steps over a small log to the right of the trail and into the brush. Then Zach steps over the log, following Craig's footsteps and into the brush. I am next, with Douglas about 25 feet behind me down the trail. I step over the log in their footsteps and feel a sting. And then another. And then another. Having never been stung before, it took me a few stings to realize we'd disturbed a hornet's nest and it chose me as the time to get mad (better me than my son). Well, I've got some pretty crazy curly hair so you can picture me flailing about, probably screaming, then turning to run - yes, run - down the trail with a 50 pound pack on my back - towards Douglas, who starts yelling that I shouldn't run toward him (he got stung a couple of times, too). Zach and Craig told me not long after the incident that had I not been so attacked and it was not so scary that it was actually a pretty funny sight. We stopped counting actual sting holes at 17 but pretty sure it was more; I was stung straight through my hiking clothes. Not having been stung before, we watched for signs of difficulty breathing. Thank goodness I didn't have that but I did have an anaphylactic reaction. The picture above was taken just a minute or two after the attack but it got way worse. Both arms from elbow to fingers swelled terribly and filled with bruise-like blood pools at the surface of my skin. And it was painful. For the next three days it was painful, and I wasn't expecting that. Here's the weird thing - almost immediately after the trip my body started to have reactions that continue to this day, more than three years later. Two fingers on my left hand (which reacted way worse) got arthritis so badly they bent, I got those blood pools constantly - any time my arm was bumped or scratched, I went through a "mono" like exhaustion for about three months that almost curtailed my trek across the alps the following summer and the inside of my eyelids are now honeycombed. The doctors looked for every conceivable reason for any of these things to happen - I went to several specialists, had multiple tests - and what they came up with was that I had so much poison in my body it was just too much to handle. 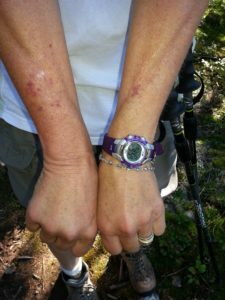 Through allergy testing, they found out I am severely allergic to a type of bee and now I carry an epi pen into the backcountry. I use drops in my eyes and take an allergy pill to curtail the blood pools, which rarely happen anymore. None of these things stopped me from continuing what I love to do but it's clear to the docs that the event started autoimmune responses that continue three years later. I get a great bill of health every time I see a doctor, just allergy related issues that I've gained from my epic hornet adventure.